Amaze and educate your kids by sharing fun and interesting facts about toucans with them. With their colorful bills, these birds are interesting to see and learn about. 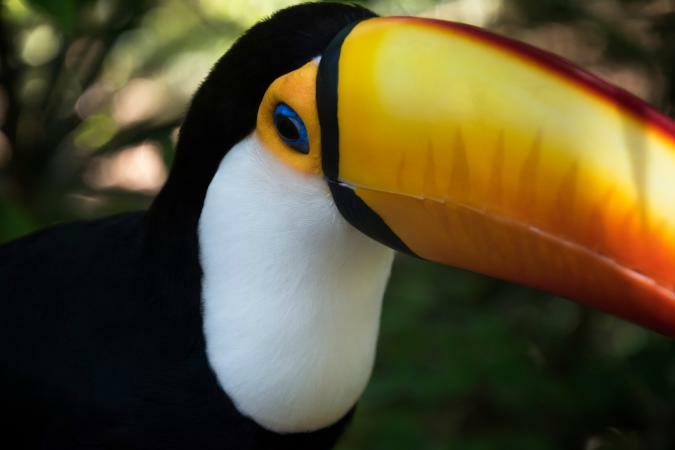 Their exotic appearance is quite appealing to kids and adults alike and you might be surprised by some of these toucan facts. Wild toucans are exciting to watch and listen to because of their colorful personalities. Learn a few interesting facts about toucans and share your newfound knowledge with your children as well as other family members and friends. A toucan's true home is in a rainforest canopy. For example, living in the Amazon rainforest, some toucan species have access to the shelter and food they need. They are healthiest and happiest in the wild, so it's challenging to recreate a suitable habitat in captivity. Toucans reside in the jungles of South America and Central America and live together in small-sized flocks made up of about five or six birds, but they can be as large as 22 birds. They sleep in holes in trees and, to make themselves smaller, roll up into balls with their beaks tucked and tails flipped up. Toucans don't make their own tree holes, they find old woodpecker nests or places where branches have fallen off to use as homes. 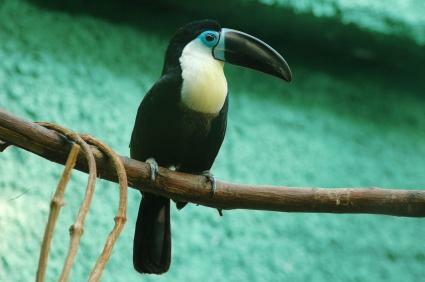 In the canopy, or upper layers, of the Amazon rainforest, toucans are often found. Species living in the same habitat have distinct calls so they can recognize each other. Unlike many other kinds of birds, toucans don't migrate. 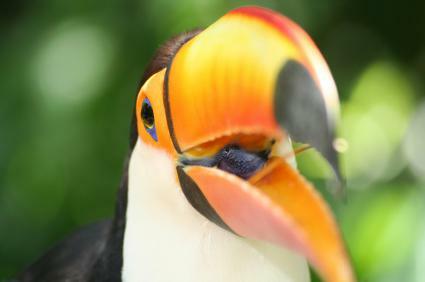 Toucans eat a lot of both plant and animal foods. Their diet consists of, bird eggs, insects, fruit, reptiles, rodents, and other birds. First-choice fruits include papayas, mangoes, fresh berries, bananas, apples, grapes and melons, almost anything non-citrus. They will also gobble down spiders and insects, and sometimes snakes and lizards, that they find in trees. If a toucan discovers a nest, it will eat the eggs and even the baby birds of other species. Before it can eat, a toucan has to toss its head back in an effort to get the food to where it can swallow. When foraging for fruit, multiple species gather together in a large group. You might also be wondering, just how much does a toucan weigh? An average full-grown toucan weighs less than a pound - about 14 ounces or 400 grams. Full grown toucans are slightly less than two-feet long. From top to tail they are about 20 inches. The lettered Aracari toucan is the smallest at only eleven inches tall and weighing under 5 ounces. The largest species of toucan, the Toco, weighs about one-and-a-half pounds. A toucan's tongue can be up to 15 centimeters, or 6 inches long. Toucans have really short legs so their height is mostly made up of their actual body and head. What does a toucan look like? Each toucan species features distinct colors and color placement so they can recognize their own kind. Toucans are monomorphic which means the males and females are about the same size and coloring. The only reliable way to tell if a bird is male or female is to see if it lays eggs. Their tail feathers are short and stiff. Toucans are mostly a shiny black in coloring. Different species are decorated with other colors including white, orange, red, green, and yellow. The common names for many species of toucan are descriptions of the colors on their beaks. Just what makes a toucan stand out from other birds? One defining feature is its unique bill. They have larger bills, in proportion to the size of their body, than any other birds. Toucans' bills average about eight inches in length. Studies suggest that a toucan's bill is so large because it helps to keep the bird cool in the warm climates where it lives. Since they are unable to sweat, they need their bills for air conditioning. Toucans' bills are not solid. Instead, their structure is similar to a honeycomb, making the bills extremely light. 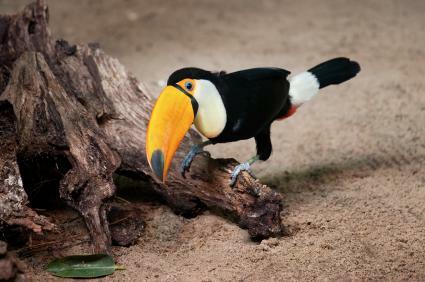 Because toucans' bills are so lightweight, they can't be used for digging or fighting. The large bill does allow them to sit in one spot and reach for food, which is a good thing since toucans don't like to move around much. They make use of the length of their bills by digging into holes in trees and logs to grab prey. Toucans also can use their bills for camouflage. Their beaks are filled with blood vessels that circulate the warm blood throughout their bodies to help regulate their temperature during cool jungle nights. Baby toucans don't look anything like their large, shiny, and colorful adult companions! Female toucans lay two to four eggs every year. Baby toucans are not born with large beaks; it takes several months for their beaks to reach full size. It can be tricky to know whether a baby bird is male or female. Both parents incubate and care for a baby Toucan. Mom and Dad toucans take turns incubating their eggs for anywhere from 16 days to 6 weeks. Toucan chicks are born with bare skin and their eyes closed. Chicks open their eyes and start to grow feathers around three weeks old. Babies don't leave their nest for up to eight weeks, then they fledge. People love looking at toucans because of their unique colors and bill, but they're also fun to watch because of the silly ways they act. A group of toucans is called a flock. Toucans are loud! Even though they are camouflaged in the canopy, they don't stay quiet enough to go unnoticed. The sound of a toucan is very similar to a croaking frog. Toucans love to play, but they aren't great at learning tricks. The birds are super smart, but they are as bouncy as Tigger from Winnie the Pooh. A healthy toucan will spend its day jumping from limb to limb of a tree, seldom perching for more than a few minutes. Some favorite activities in the wild are bonking beaks in playful jousts with flock mates, and hunting for games to play. Toucans sleep with their huge beaks tucked under their wings to keep warm. Toucans don't do a lot of flying, so they need specialized claws to help them bounce around the trees. Toucans have four claws: two on the front and two on the back. The arrangement of their toes is called zygodactyl. Their claw configuration allows them to cling to branches and balance on trees. Toucan toes are long, curved, and strong. Since toucans mostly stay high up in the sky, they don't have many natural predators. Jaguars and other big cats are natural predators of the toucan. Eagles, hawks, and owls are also Toucan predators. Humans trap wild toucans for the exotic bird trade, so may be considered unnatural predators. Toucans use their loud voices to warn others and attempt to scare away the predator. There are about 40 different species of toucans. The most widely recognized toucan is the Toco toucan, which has a long, orange bill. The Yellow-browed toucanet is the only species listed as endangered. Red-billed toucans are the second largest of the species and feature bright blue skin around their eyes. Native populations in South America believe that toucans are able to provide a spiritual connection between the dead and the living. Toucanets (mini-toucans) are dimorphic, meaning there are distinct differences between males and females. Toco toucans are one of the most iconic of the species because of their distinct look and large size. A Toco's bill is one-third of its body length. The Toco has the largest bill of any bird in the planet. This bird is the largest of the entire toucan species. Their bills are a reddish-orange color with a black tip. There are two subspecies of Tocos, the R.t. toco and the R.t. albogularis. Tocos are typically found in the central parts of South America. A Toco's song can consist of up to 50 notes in under one minute and includes sounds like "groomkk" and "rrraa." This species is less social than many other toucan species. Some people keep toucans as pets. These birds can make a great addition to the right homes if owners follow exotic pet laws, which can change any time. Toucans require special care, so you'll want to make sure there's an exotic pet vet in your area before buying your toucan. If your family is thinking about a pet toucan, be sure to look for one that has been bred domestically, not poached from the wild for the exotic bird trade. The colorful clownish birds eat about every fifteen minutes and they projectile poop about that often, too. It's very messy, if you have a pet toucan and you don't happen to live in the jungle. Each state in the U.S. has its own laws regarding what animals you can own as a pet and whether you need a permit. You can own a pet toucan in the state of California once you obtain a permit. Kentucky allows toucans as pets without a permit or certificate. There are many reasons a toucan can get into trouble and need rescue. Poaching removes wild birds from their habitats for the illegal pet trade. Predators will threaten an injured or immature toucan that may be unable to get away. When a baby toucan falls from its nest, it is more likely to be eaten than to be rescued. But one lucky baby made it to a rehabilitation center in Costa Rica with its appetite for life unruffled. Now that you know a little more about these brightly colored birds, you can share your facts with your children so they to can come to understand and appreciate toucans. After all, toucans are fascinating creatures!